Friday night is always better when your friend Buena Vista stops by to join you for cocktails. The 2008 Ramal Vineyard Pinot Noir is good company to be sure. In what’s becoming a pattern, I had a glass of this berry-tinged red on Thursday night before a fantastic dinner of seasoned chicken breast, mashed potatoes, and veggie-heavy garden salads. Interesting mix of seasonings and wine that evening; it was hard to hold the line at just a single glass. Friday’s dinner–pictured here for sake of posterity–took it to another level. My wife and I collaborated (yes she did the majority but I capably manned the grill) on a thick tasty London Broil, seasoned with plenty of salt, pepper, and similar, and we had too a few tater tot crowns and a light salad along with the cowflesh. It all came together in the 2008 Buena Vista–a smooth red that emptied far too soon. Sometimes I get to holding onto the Buena Vista, thinking that it should await a better occasion, and I’m glad that was not the case here. It was great and thankfully have a few related varietals from that fantastic vineyard to sample in the coming weeks and months! 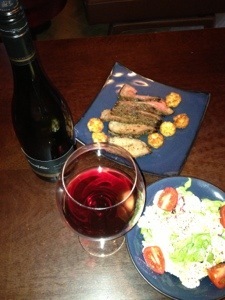 This entry was posted in Pinot Noir and tagged california winemaking, USA.